It’s always a pleasure for me to receive an email from Campfire Audio. This time, they sent over a pair of their newest IEMs, the Comet. They fall in CA’s more modest price-range, around $200. The last headphones I reviewed from them were their $800 Cascade which, while one of my favorite headphones of all time, are prohibitively expensive for many, if not most. Let’s jump in. The headphones come in a new form factor for Campfire Audio, with their shiny, metal exterior. 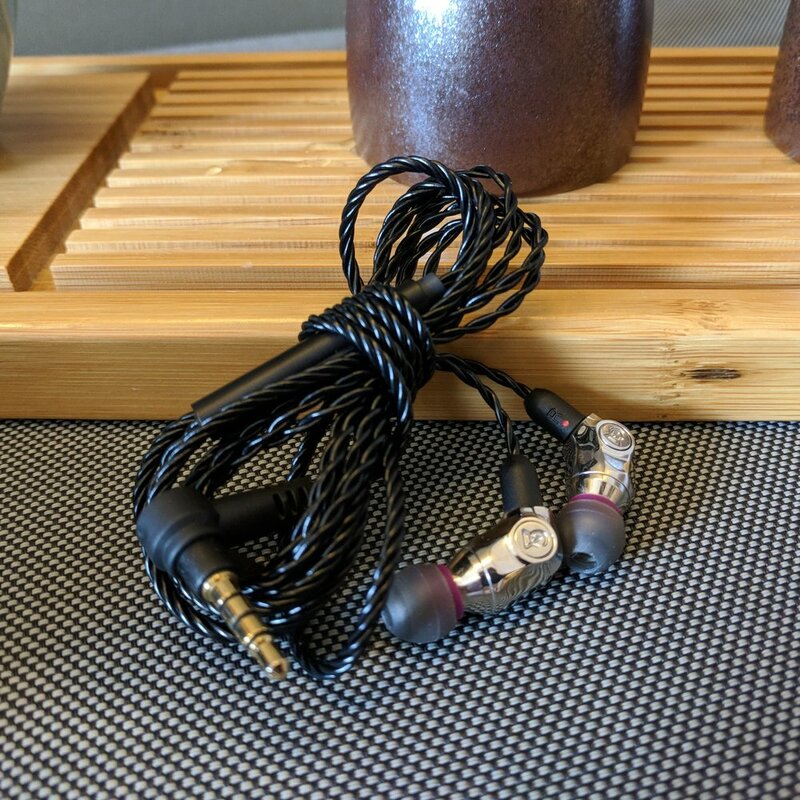 The IEMs themselves are very small, with the MMCX connector accounting for about a quarter of their apparent body size. I find the design very attractive visually, and they have a nice heft to them – they certainly don’t feel cheap or liable to break easily. The user-chosen eartip slips over the metal-grill-covered nozzle of the headphone, and it’s as simple as that. I found that I could wear them both over-ear and normally, with no distinct preference for either, although that’s just a personal choice. One may suit you better depending on the specific geometry of your concha, etc. As always, the included cable is top quality. It’s made by Litz, if you’re one to care for that type of thing, but I am not. The cable is very supple and resistant to kinking. On the right channel’s cable, there’s a three-button controller with a microphone that I found to work very well with my Pixel (and even my MacBook, oddly enough). The microphone is not extraordinarily high quality, but it’s not bad, by any means. It won't disappoint on phone calls, that's for sure. The cable terminates at the source-end with a right angle, 3.5mm TRRS auxiliary adapter. The headphones come in a zippered, hard-shelled, leather case that’s just the right size and feels very premium. For those familiar with Campfire Audio’s other offerings in this size range, it’s the same case, with an almost shag carpet-like inside. In general, particularly for the price point, everything to do with this category feels very premium. Good craftsmanship, no obvious machining/processing defects, and a solid, consistent feel to the product as a whole. This review has been in the pipeline for a while, and aside from the general busy-ness that’s precluded me from spending as much time reviewing as I’d like of late, I was having trouble characterizing the sound signature of these headphones for that while. However, I think I’ve put my thoughts together well-enough at this point, and don’t think that more time spent will improve the outcome in the end, regardless. These IEMs lack a particularly large emphasis. If anything, they lean more into their mid-range than any other, but they really do lie fairly close to neutral on the whole, which is something I rarely see, particularly in this price range. The granularity of each of the ranges will be broken down below, so I’ll save any more commentary there for a bit later. As would be expected, from a pair of completely closed IEMs, the soundstage is relatively small, but not imprecise, by any means. These aren’t the most detailed headphones out there, but they do a pretty commendable job for their price range and form factor. Isolation is good, and microphonics are extant, but not noticeable unless purposefully elicited. Generally speaking, the bass is fairly reserved. It serves well to underscore heavy impacts and provide some back-beat where necessary, but it doesn’t stand out in doing so. That which there is, though, is well-textured, well-controlled, and in general, good quality. I didn’t find this headphone tripping over itself in fast sections of dynamic bass, nor did I find it too light to be enjoyable. I am, personally, a fan of a bit more bass in my sound signatures, but that’s purely an issue of personal preference, not of execution. The mids are the high point of this headphone (in volume, at least). Beyond sheer volume, in terms of quality, they are slightly lean for my taste. It seems generally true that as the mids drift towards lean, the result is usually more detail, whereas when they drift towards lush, some detail is lost. I think that there’s a better balance that can be struck than the one found in these headphones. But again, that’s personal opinion, and yours may differ. They certainly aren’t bad, by any means, just not my cup of tea. They don’t edge into abrasive or unpleasant, they’re just a little bit dry. The treble is inoffensive on the whole, and effective at achieving what treble, in any headphone, should. It adds a great sense of airiness and lightness to the sound signature, and prevents the headphones from sounding bogged down. This range is relatively precise, lending good accuracy and fidelity to cymbal reproduction and high electronic lines. I rarely encountered sibilance with these headphones, aside from on those tracks that I know to bring it out on almost any pair of cans, which is a plus. On the whole, as always, Campfire Audio and their engineers have created an excellent pass at their target sound signature with these headphones. For those that like a bass-light pair of headphones with relatively lean, forward mids, these will satisfy. One particular use-case in which it seems that these would perform well is in high-noise environment, as mid- and treble-leaning headphones stand out there. The cable that they come with is absolutely great, (again) as always, and the accessories packaged in our stellar as well. I’ve always been a fan of the carrying cases that are included with CA’s headphones, and that holds through this pair. Thanks again to Campfire Audio for sending these over, and although these weren’t quite what I look for in a sound signature, I continue to be excited for what I’ll get to hear next! These headphones were provided to me by Campfire Audio. I am not being paid by anyone to write this review, to endorse the product reviewed, or for the content that I put in the review. These headphones were powered by an Astell&Kern AK Junior, a Google Pixel, a Neurochrome HP-1, and by whatever soundcard is in the motherboard of my computer. I have had these headphones for about two months, and I have put about 30 hours of analytical listening through them during that period.